The Rev. 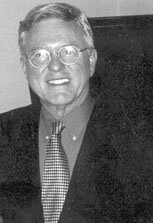 Earl K. Holt III was called as the fifteenth minister of King’s Chapel in December of 2000, having served as minister of the First Unitarian Church of St. Louis since 1974. He is a graduate of Brown University and the Starr King School for the Ministry, which also honored him with an honorary doctorate in 2004. He is the author of a biography of the Rev. William Greenleaf Eliot, founder of Washington University and grandfather of the poet T. S. Eliot. Mr. Holt was a founding member of the T. S. Eliot Society and delivered the annual Eliot Memorial Lecture in 1982. Among other current activities he serves as a trustee of the Unitarian Universalist Urban Ministry and the MGH Institute of Health Professions, and on advisory boards for the Bible Workbench Curriculum and the Journal of Liberal Religion. Earl Holt is married to Marilyn Holt and has two grown daughters, Alicia and Julia.